Please arrive early enough to allow time for registration with "Hash Cash" prior to departure. "Roo"will be away so "Snake" will be Hash Cash. The Hares will be "Lay Me" & "Can Do". All welcome, especially newcomers to the compound or Ulsan. Come for a walk / run through the local countryside and enjoy the social gathering afterwards. Families especially welcomed. 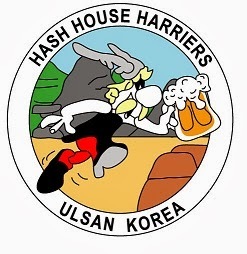 Note: The 2004 Ulsan Grand Hash will now be held on Saturday 23rd October as run Number 434. Please use sign up sheet on clubhouse notice board by 4th October for pre-registration if you have not already done so at HHI.